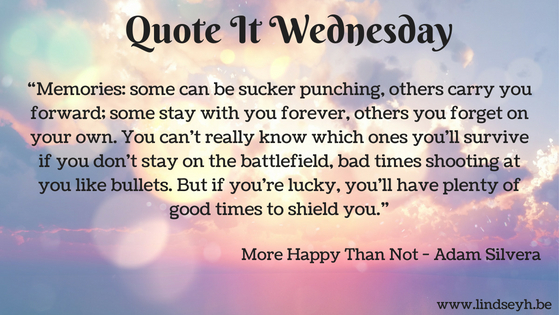 Today I feature a quote from my first Adam Silvera, who has since become an auto-buy author for me and pretty much the only auto-buy author who is allowed to make me cry on a regular basis with his books. More Happy Than Not especially hit me hard, because it really got me thinking about memories. I do actually treasure all of my memories, even the painful ones, because they made me who I am today. But sometimes, yes sometimes, I do find myself wondering if it wouldn’t be nice to be able to choose which memories you could just completely erase. Would you miss someone or something less hard if you didn’t remember them? Or would you just end up erasing all the good times, all the lessons learned along with the pain? If so, would it still be worth it? WHAT DO YOU THINK OF THIS QUOTE? If given the choice, would you consider erasing some of your memories forever? Or would you prefer to keep them all, even the painful ones? That is one powerful quote! 😮 I think if I could I would erase some of the really bad ones, I think everyone has those. Yeah some very bad memories could definitely be erased for sure. Great pick this week! When it comes to memories, I seem to have a lot which are painful or sad or embarrassing. I’m not sure why, but I wish sometimes I could forget them! Thanks! Yes, this quote (and the entire book ofcourse) definitely make you think about memories. I love Adam’s books, and this is SUCH a good quote (and book!!). I think I’d like to keep all my memories. I don’t have all good ones – I mean, who does? – and there are people and moments I would sometimes like to forget, but I think it’s good to have these because it helped me become who I am now, and I wouldn’t want to erase a whole person from my life and lose all the good too. Adam’s books are amazing indeed 🙂 Yeah, I think I feel the same way, though there are of course memories I’d rather forget, I wouldn’t want to erase everything and lose the good too. It’s my mission in life this year to read at least one of Silvera’s books. I love this quote and like you, I treasure all of my memories because I feel like everything I remember has made me who I am today. There have been a couple of people in my life that I’ve wished I could “un-know” but that’s a whole different story, lol.